One evening after dinner with my usual Friday group in a Japanese restaurant in Arlington, VA, we noticed that a shop space a few doors down had been renovated into a new eating establishment, a conversion from its nondescript former life. A quick peek through its storefront indicated that it was now a Moroccan eatery to which we exclaimed that we were going to make it a point to pay it visit. 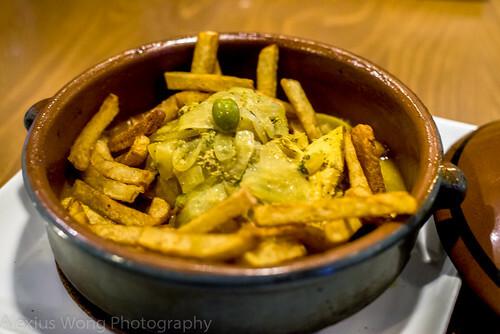 With the daunting thought that a number of places serving this North African cuisine had closed their shutters in the latest economic downspiral, we were eager to discover what this newbie had to offer. So, over the last weekend, my groupies and I sauntered through its doors. 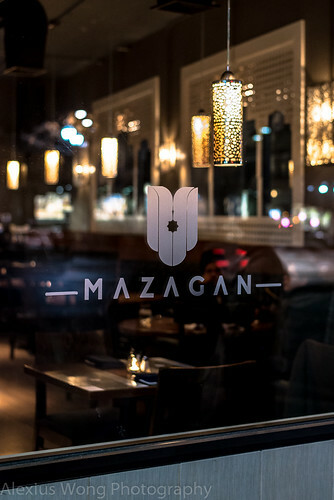 Walking in Mazagan, one notices the space with its open concept with the dining area in the front, a bar to the left, a hookah lounge to the back and an open kitchen across from the smoking den. We took our seats around a round table with one half protected by a curvy banquette, lowly lit by some Moroccan-inspired modern lamps – every decor detail had a nod to North Africa without being stuck in the traditional. For our appetizers, I chose to go the traditional route to ascertain how the kitchen handles the staples. The first was a trio of cold vegetable dips listed as Taste of Morocco. Chakchouka consists of wood-grilled green peppers and tomatoes mixed with olive oil, hand ground cumin and paprika, exuding its slightly bitter green pepper vegetal notes, some grill smokiness, and tomato sweetness. 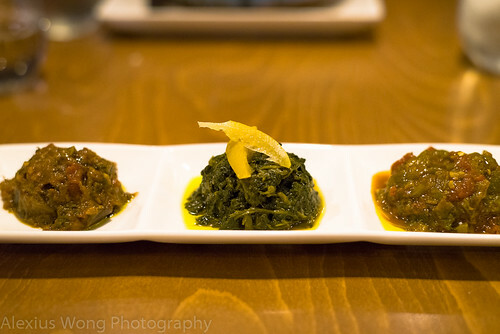 Bakoula is listed as sautéed spinach with olives, preserved lemons, garlic, cumin, paprika and olive oil. The spinach was fresh-tasting studded with a whole clove of caramelized garlic, but missing the listed spice flavors which would have added another note of interest; the slices of preserved lemons stood out as not wanting to join the spinach’s company, thus seemed out-of-place. Zaâlouk is made of wood-grilled eggplant and tomatoes with olive oil, hand ground cumin and paprika, which I quite enjoyed the smoky vegetable marrying with the spices and slightly sweet tomato, this combination reminding me of Italian Caponata. Overall, this trio was well-executed and a wonderful way to open up the meal, albeit a bit pricey for the small amounts. 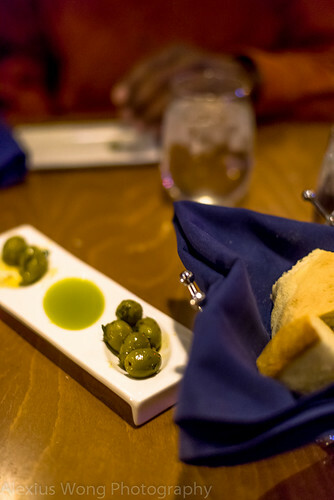 The complementary spiced green olives, grassy olive oil, and Moroccan bread were of excellent quality which we couldn’t stop munching on. A couple of dining companions decided to open their meal with the classic Moroccan soup – Harira. The menu list it as made with tomato, lentil, lamb cubes and chickpea. The bowl arrived steaming with a fairly thick soup in it. After allowing the orderers a few spoonfuls, I was curious to trying a few sips from it. What I could taste from the soup was the gestalt of an alchemy of cooking all the different ingredients producing something that was delicate without any of the ingredients exerting their unique personality. This was a very tasty sip that was beckoning me to continue tasting it either to figure out the subtle spice use in it or merely to savor this warming and soulful bowlful. The use of grain was sufficient to give it body without it becoming porridge like. A faint lemon juice note in the background further added interest and a balance to this slightly starchy soup. 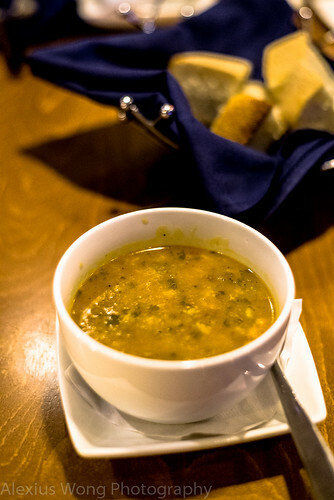 This is an example of what good soup is, a final product that is savory and a transformation as the result of the chemistry of cooking the right ingredients. 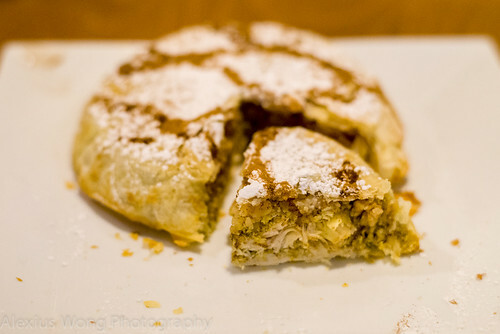 Another standard fare from this cuisine is Bastilla. The menu lists two types, chicken and seafood, the latter being a novelty for this diner. However, I chose to go with the traditional version made with chicken, or pigeon in that North African country. The “cake” arrived dressed with a fairly light sprinkling of powdered sugar punctuated by lines of cinnamon powder. One cut into it revealed its true nature. The phyllo dough was fully cooked but still a bit supple, an indication that it was not baked too long. But it was the stuffing that was the appealing star with its moist finely shredded (very) chicken meat, a light sprinkling of fine bits of almond, and a hint of nutmeg permeating through the mixture. What I appreciated about this sweet/savory mixture is that its savoriness was never detracted by the powdered sugar or the nuts, which has occurred in other versions that I have tasted with the heavy amounts of the sweet and equal amount of nuts. Here, we have an exotic cake reminding you that it’s a savory appetizer with hints of sweet and spice. The seafood version will indeed be on my order during my next visit in order to quell my curiosity of this untried stuffing. 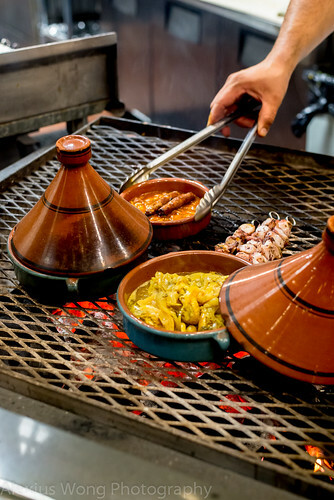 For the main courses, everyone decided to go with the true-and-tested traditional dishes from this North African cuisine. A couple of my dining mates went for the Chicken Tagine. The dish arrived in the traditional earthenware, and its top was removed once placed on the table, letting steam escape after sitting on the charcoal grill visible from the dining room. What was revealed was a bit of a surprise – bits of slow cooked chicken were topped with a sprinkling of french fries, which raised our curiosity since we were not used to it being served in this fashion. A quick query to our waiter enlightened us that it was common for tagines to be served this way even though we were used to seeing potato and carrots as the dish’s usual partners. A taste of my companion’s dish pointed towards fork-tender moist chicken cooked with preserved lemon and green olives, made yellow by cumin and slightly fragrant by a light use of spices. Despite the other flavor elements, I found the dish slightly under-salted, but better less than more. A slight resin-like after-note in the sauce was intriguing, and after biting into some preserved lemon, I realized that that flavor came from the citrus itself – that must be some super lemons with such a strong flavor in the rind. However, I felt the spicing could have been a bit stronger to pull all the elements together and to keep my interest a bit longer. Nevertheless, my friends truly enjoyed their dishes, notwithstanding the fries that soaked up all the flavors. Another diner’s entrée was Lamb Couscous. A wonderful oval bowl arrived with a large mound of the pasta grain, with large chunks of lamb shank and large pieces of carrots, zucchini, pumpkin, and onion wedges sitting on top. The chunks of lamb shank were moist and fork-tender that exuded a fresh taste with an interesting note akin to fresh leather, and by this, I mean it in a good way, reminding me of my youth when my father would order a whole kid lamb that was grilled in the yard for the annual office dinners that exuded similar qualities and flavor. I just couldn’t get enough of this flavor along with the lamb’s tenderness. 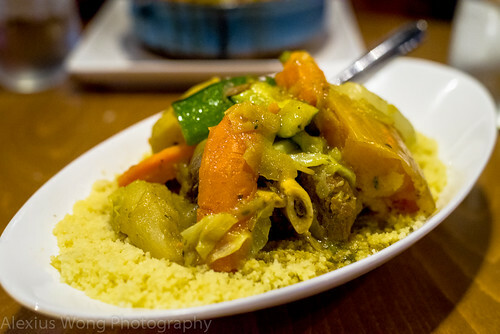 The bed of couscous underneath was very decent, being fully cooked and moistened with the stock enriched by the meats and vegetables. The pieces of vegetable appeared fully cooked since I did not have a chance to dig my fork into them. My dining companion seemed very content with his order and he was making quite a dent on it. After our savory courses, we inquired about the sweet offerings. Everything on the menu was French-inspired desserts with the exception of the ubiquitous Baklava and Orange with Cinnamon, both of which I was very familiar with. Despite not having a sweet ending, we were quite pleased with the cooking from this new kitchen, starting with the trio of cold vegetable dishes, the enticing Harira soup, the fairly well executed Chicken Tagine, and the as-good-as-it-gets Lamb Couscous. With cooking this impressive a midst the swanky decor of this new space, I see my dining group and I coming back for more of their offerings.